3 Year Aged Cornish Quartz Cheddar will quench your hankering for crunch! I hope you all had a lovely Easter and that the food & chocolate kept you full! This week I’m featuring a cheese that my fellow Deli & Cheese colleague Max Nailor enjoys which is the 3 year aged Cornish Quartz Cheddar. Produced exclusively for Waitrose by Davidstow Creamery & aged for 3 years this pasteurised cow’s milk & vegetarian friendly cheese packs a crunchy punch with its added Cornish sea salt to deliver a superior taste experience. The 3 year old Quartz was first listed as a limited edition for Christmas before becoming a permanent edition for Waitrose! Quartz has a texture as firm and flinty as the Cornish cliffs yet delivering a smooth, rich, intense and robust yet broad appeal flavour. The dairy is situated on the North Cornwall Coast, all the cheddar produced at the Davidstow Creamery specially for Waitrose. Its rated as an extra mature cheddar which on the scale is a 6 but with its creaminess it may appeal to a wider audience. Like some of the best things in life the process of making a cheese to become crunchy was an accident, but when the makers, graders & professionals tried it they found that it hit the spot and so these cheeses are now made with an imperfection to make the perfect crunch! There are an increasing number of crunchy cheeses with the likes of Belton Farms now joining in with their own line of cheeses to cater for the cheese eaters quench for crunch (If you like a sweeter more honey flavoured cheese then you must try their White Fox cheddar). It is becoming a very popular and ever increasing line of cheese to make sure that it meets the foodies needs & requirements. 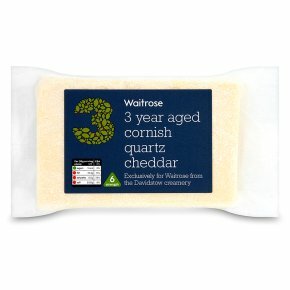 To describe the flavour of the 3 year quartz is difficult but it comes in parts because it starts off as creamy & smooth cheese which then progresses with the crunch to become salty, and the final part is the strength but it is incorporating a sweet caramel flavour that adds a whole new depth to the cheddar which is unexpected. Add this all together and you have a very tasty cheddar indeed which is best for a ploughmans, sandwiches or a cheese board. When I asked Max what he liked most about this cheese he replied “It’s a nice cheese and its just a good cheddar with a good flavour.” He is quite correct although it may not be for everyone though with its crunch & sweetness it’s certainly not bad but may not be what you would expect from a mature cheddar. If you’re after a cheese which is a little more unique then head to your local Waitrose cheese counter to try this Cheddar recommended by Max from Waitrose Lymington!